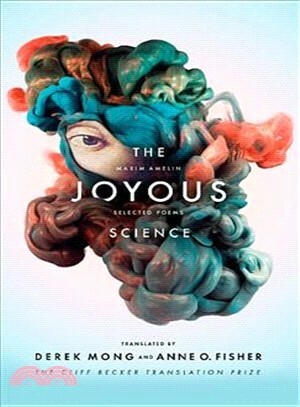 The Joyous Science offers a comprehensive introduction to Maxim Amelin. The poems span Amelin’s long career and cover his many thematic concerns. A loving collector of neologisms and a devoted student of Revolutionary word-smithing (à la Mayakovsky), Amelin keeps his poetry in suspension through a tension of opposites. He writes of bodily pleasures while musing on the body’s resurrection. He is critical of Russia but loves its language. Riddles, odes, and elegies appear alongside a long poem, “The Joyous Science.” This 20-page mock epic chronicles the exploits—both real and imagined—of Jacob Bruce, an astronomer, alchemist, and military strategist to Peter the Great. Amelin is a unique force in contemporary Russian poetry. Poet, critic, editor, and translator, Maxim Amelin is among the last generation of Russian poets to grow up in the Soviet Union, or as the poet Aleksei Tsvetkov wrote in Poetry Magazine: “those in the thirty- to forty-year-old range… the children of perestroika—or one should say the orphans, since their alleged mother went missing long ago” (February 2008). The recipient of numerous national awards, including the Moscow Reckoning Award, the Anti-Booker, the Novyi Mir Prize, and the Bunin Prize, his work has been translated into over a dozen languages. In 2013 Amelin won the prestigious Solzhenitsyn Prize for his contributions to Russian poetry. The author of three books of poetry, including Cold Odes (???????? ?? ?, 1996), Dubia (1999), and The Horse of the Gorgon (???? ?????? ?, 2003), he recently published his collected poetry and prose, Bent Speech (?????? ??? ?, 2011). An accomplished translator of Pindar, Catullus, Homer, and various contemporary poets, he currently lives in Moscow. He serves as editor-in-chief at OGI, a leading publisher of contemporary literature, and is a member of the Russian PEN-Club. He was born in Kursk. Derek Mong is the author of two poetry collections from Saturnalia Books, Other Romes (2011) and The Identity Thief (forthcoming, 2018), and a chapbook of Latin adaptions, The Ego and the Empiricist (Two Sylvias Press, 2017). He reviews new poetry for the Gettysburg Review, blogs at Kenyon Review Online, and recently completed his time as the Poetry Editor at Mantis. The Byron K. Trippet Assistant Professor of English at Wabash College, he has held writing fellowships at the University of Louisville and the University of Wisconsin. He received his doctorate in American Literature from Stanford University. He has received the Editors’ Choice Prize from the Missouri Review and two Hopwood Awards. His poetry, criticism, and translations have appeared in the Kenyon Review, the Brooklyn Rail, Two Lines, Pleiades, Crazyhorse, New England Review, the Southern Review, and many other publications. He can be reached at www.derekmong.com. Anne O. Fisher’s translations of Ilf and Petrov’s novels The Twelve Chairs and The Little Golden Calf, as well as their 1936 travelogue Ilf and Petrov's American Road Trip, have been widely praised. Her translations of Andrey Platonov and Margarita Meklina have appeared in Cabinet Magazine and in the 2015 Norton anthology Flash Fiction International, while her translations of Ksenia Buksha are forthcoming in Cardinal Points and the St. Petersburg Review. Her translation of Buksha’s novel, The Freedom Factory, is forthcoming from Phoneme Media. With her husband, poet Derek Mong, she has co-translated the poetry of Maxim Amelin; their work has appeared in Asymptote, the Brooklyn Rail, Two Lines, and elsewhere. In 2014 they published the first English-language interview with Amelin in Jacket2. Fisher is a recipient of translation grants from the NEH and NEA and lives in Indiana with her family. She has a Ph.D. in Russian Literature from the University of Michigan.